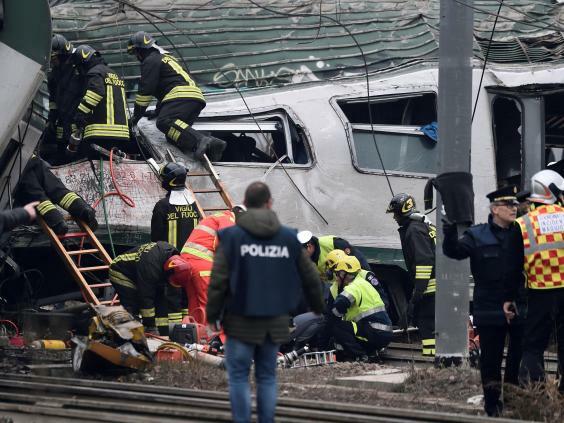 At least three people have been killed and 10 seriously injured after an eight-car passenger train derailed on the outskirts of Milan, Italy. A fire official speaking at the city's control room put the death toll at between three and five, but this has yet to be confirmed. As many as 100 more are said to have been hospitalised with minor wounds, according to La Stampa. The accident happened just before 7am during rush hour this morning at Seggiano di Potello, a suburb on a busy commuter route from Cremona operated by Trenord. The cause of the incident on the approach to Milan's Garibaldi station remains unknown but two cars appear to have peeled off the rails and come to rest at an angle. Emergency services are at the scene with members of the local fire brigade in the process of rescuing travellers trapped inside the carriages. The tragedy is expected to cause major delays across the city's transport network for the rest of the morning. Italy's ageing rail system has been the subject of much scrutiny in recent years. In 2016, 23 people were killed when two trains collided on a single track in an olive grove in Puglia. In 2009, 32 people were killed when a freight train carrying liquefied petroleum gas derailed and exploded in Viareggio in Tuscany. Trenord is a joint venture between railway operator FNM and a unit of state railway operator Gruppo Ferrovie dello Stato.